The long, hot days of summer are coming and the harshness of winter will soon be nothing more than a forgotten memory. There will certainly be sweaty days when idealized memories of snow lovingly pop into my mind. This chilly photo is my example for this week’s challenge, “Extra, Extra” (share a photo that has a little something extra). 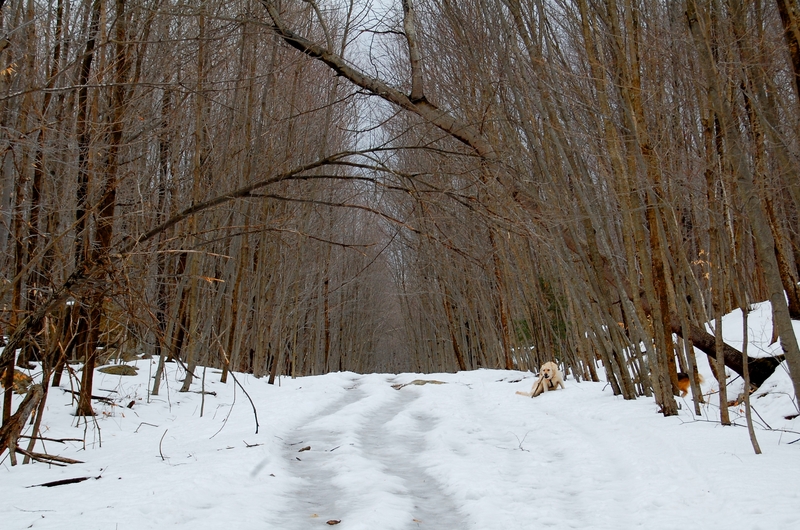 For the keen eye, there are two unexpected dogs in this shot–click to enlarge. This photo was taken in the Hudson Valley. I think New York state is a beautiful part of the country and I’ve been known to take quite a few long walks in the forest. Occasionally, this location has informed my own writing. I once wrote a short story taking place in the same biting locale and I am currently working on a longer text taking place in a fictional version of this same village (albeit, in the summer).